The touchview lets you view operation and access remote charger setting menus. Color touch screen provides intuitive selection of measurements (amperage, voltage, charge percentage), charging phases (boost, absorption, float), and allocated available power and possible operation faults. Color touch screen measurements: voltage, amperage, charging mode and operating parameter settings. Anomaly display: battery voltage too low, internal temperature too high, fuse. Connection via an RJ11 plug. External diameter 3-5/8" (chrome plated trim), mount using 4 screws. Can be mounted on front panel of Pro chargers. Works with Pro and 12V-60A, 24V-30A Premium chargers. 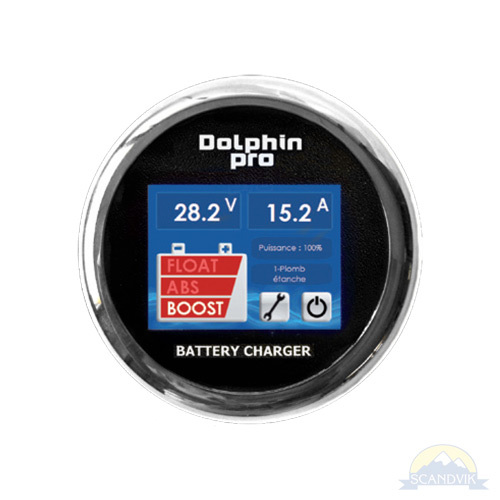 Click here for more detailed information and to download Dolphin Battery Charger Product Manuals.